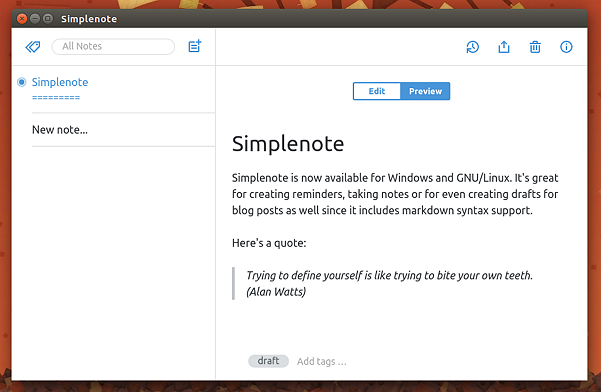 Simplenote is a minimalist looking and a versatile syncing text editor that was only available for Mac OS previously. Not anymore though, because Simplenote developers have just released a new version finally enabling the application to natively run on both Microsoft Windows and GNU/Linux operating systems. You can use Simplenote for creating reminders, taking notes or for even creating blog post drafts since it includes markdown syntax support (not yet available for the Mac version) which is handy since it automatically converts the text into the HTML format once the proper formatting is used. You can also share your content easily with others (collaborating), publish notes online with actual URLs pointing back to them, add tags for easily organizing the notes, search for notes (it’s quite fast) etc. I also love idea of using a horizontal slider for undoing -- it’s extremely easy to use, quite fast and very intuitive. With Simplenote, all of your notes are saved on a centralized computer (server) and you can access all your notes from devices that run iOS, Android, Mac OS, MS Windows and GNU/Linux easily as long as you have the client application installed. If interested, please visit this page for downloading Simplenote (it’s completely free to use).